When Rosie O’Donnell debut her new show a little over week ago on Oprah‘s OWN network, there has been much chatter about whether this move is a good one for her or not. Of course, Rosie tends to bring some controversy with her because she basically speaks her mind and some people disagree with her. In this male dominated society, where strong women still receive an unfair critical shakedown from both the media and society, Rosie has certainly taken a beating. She has not had an easy road, battling her own issues, all very human, and in the public. However, what Rosie has that has endeared her to the majority of the public is her unabashed honesty. She has struggled with relationships, depression, weight, her career, loss and other things, but she has always picked herself up. She is as American as they come. Yes, she is a Lesbian but she is more American Pie than Mrs. Cleaver from Leave it to Beaver in the most important ways. Even when she criticizes some acts of the government and more accurately, politicians, she tears up with more red, white and blue in her heart to all those things that are truly Americana. Rosie is all heart. I watch her show and there are inklings of Merv Griffin, Carol Burnett, and all TV pop culture but the show is still uniquely, Rosie. She is nearly 50 and it shows that she has reach this age where she understands more of her destiny and is comfortable in her own skin. How appropriate that she has teamed up with another iconic television icon and societal leader, Oprah. The OWN network is a gathering place for visionaries and lifters. We need a place to dip our buckets to refresh our souls with laughter and wisdom in the barren desert of television. We can find it in the deep well known as OWN. Rosie is there and Oprah is there. Rosie has found her destiny there and owning it. I am watching her show and loving it. My bucket is full and and I am filling it up daily. 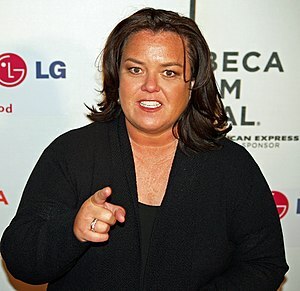 Rosie O’Donnell tells Oprah’s O Magazine: The rage has gone away.